Young David has been running around for the last couple of weeks telling everyone some inconvenient truths, like for example that his cousin Barnabas is dead and sleeps in a coffin in his basement. This has not been the rocket sled to popularity that you might expect. Eyebrows have been raised. But David has an adult ally, at last — Dr. Dave Woodard, who’s finally realized that something weird is going on. Unfortunately, the actor who plays Woodard just left the show unexpectedly, and the part has been recast in a hurry. Let’s see how it goes. Dr. Woodard has returned to the Eagle HIll cemetery, to see the Collins family mausoleum. He meets the ghost of Sarah Collins in the crypt, and things get appropriately cryptic. Sarah: I knew you were going to be here. Woodard: How did you know that? Sarah: The same way I know everything else. Now, I’ve had mixed feelings about this sort of thing. There have definitely been episodes where Sarah feels like a real little girl, especially when she interacts with Maggie. But there have also been times when her choices just don’t make any sense. Why did she bring David to the secret room to see the empty coffin — thereby putting him in danger — and then leave him trapped there for two days? Sometimes she’s a real character, and sometimes she’s just plot contrivance. Today, they need to deploy Sarah carefully — they want to keep the plot moving, but not too fast. Woodard is on the path to learning the truth about Barnabas, but we’ve got a whole week to get there, so Sarah can’t just let go of all her secrets at once. The struggle here is to find a way to present that as a conflict for the character. Sarah sits down, perching herself on her mother’s coffin. By the way, are mausoleums usually hands-on like this, where it’s okay to sit down on the graves? I don’t have a wide experience with mausoleums; maybe they’re supposed to be more like IKEA showrooms than I’d assumed. Sarah: I’m mad at David. Woodard: Because he told your secret? Woodard: I think he had to tell it. Can you understand that? Sarah: Because he was afraid, just like Maggie was afraid? Sarah: Do you know why Maggie and David are so frightened? Woodard: No, I don’t. 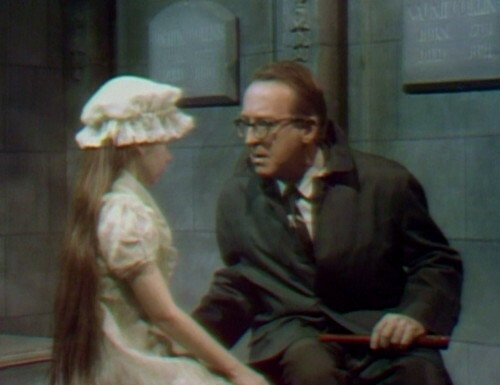 Sarah, I’m hoping that you’re going to be a very good little girl… and tell me. Woodard leans forward anxiously. 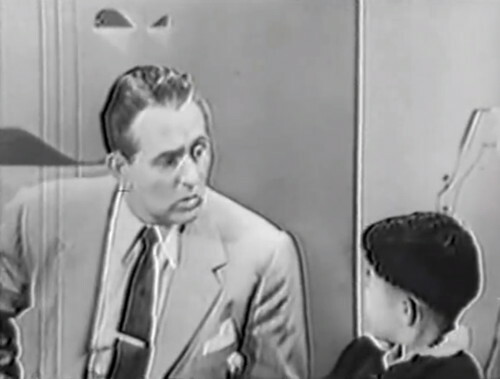 This is starting to look a lot like a “Kids Say the Darndest Things” segment on Art Linkletter’s House Party, if they didn’t pay the lighting bill and if Art Linkletter was replaced by someone who’s even more irritating. Because he’s awful, this new Dave Woodard. Just unacceptable. Look at how he keeps leaning closer to Sarah, as if he’s going to get the information faster if he puts his ear right up to her mouth. Dude is indicating all over the place. I’m going to need 20 cc’s of Stanislavski, stat. Woodard: It is your flute that David found, isn’t it? Woodard: We didn’t believe him when he told us that. In fact, many people don’t believe anything that David says. They think he tells lies, and is very sick. Sarah: I was sick once. Woodard: Sarah, when was that? How long ago? It’s not easy to describe Woodard’s vocal performance here; the best I can do is “quiet hollering”. This should be a moment of spiritual astonishment, as if the rules of the physical universe have changed into something unrecognizable. Instead, he’s acting like he found this girl lost in the supermarket, and he’s trying to find out her mommy’s name so he can announce it over the loudspeaker. Here’s another annoying thing that he does. Woodard: When you were sick, something happened, didn’t it? There’s a pause. Sarah has forgotten her line. And just at the wrong moment, he tries to fill in for her, and ends up talking over her. Woodard: David told me that. This is not a helpful way to behave. It looks like you’re shaming the other actor for messing up their line. He needs to stop doing that. They get into some true or false questions. Woodard: Sarah, look, you’re all alone on the earth, aren’t you? Woodard: It must be very lonely for you at times. Woodard: But not when you’re with David. When you’re playing with David, you’re not lonely, are you? Woodard: Well, if they put David away, then you’ll be all alone again, for a very long time. You wouldn’t like that, would you? Your honor! Counsel is leading the witness. And then he says the weirdest thing of all. Woodard: Then, if you please me, I’ll promise that no one will put David away. That’s what he says. I listened to it twelve times to make sure. Clearly, that can’t be the scripted line, but I have no idea what it could have been. “If you please me?” That sounds super not correct. 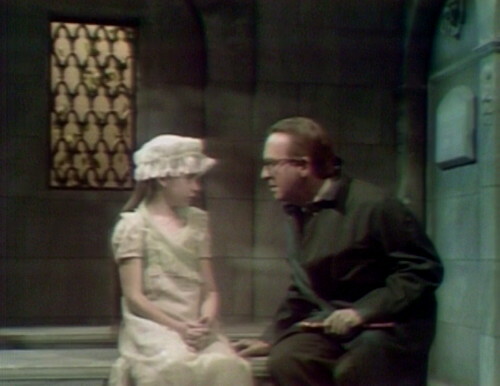 Anyway, she shows him how to get into the secret room, and he says, “One more thing that David didn’t lie about.” Which I guess is a sentence. At a certain point, she just stops talking, and then the rest of the scene is a monologue as he figures out what the room is for. This is not a pleasant thing to watch; it does not please me. He keeps stammering and indicating. Woodard: No, no… This coffin wasn’t always empty. Someone was buried here. I know that now. Yes… someone that wouldn’t stay dead. Someone whose desire to return to life was so strong, they had to wrap him in chains! That’s actually a nice line, but at this point, he’s burned through all of my goodwill. And apparently Sarah feels the same way, because she skedaddles as soon as he turns his back. So we’d like to thank Sarah Collins for being our guest on tonight’s show. After the break, we’ll be back with more Late Night with Dave. 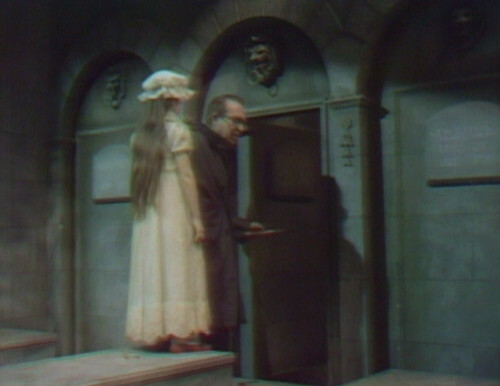 When Vicki opens the door at Collinwood for Dr. Woodard, you can see a camera at the right side of the frame. This happens again a minute later when Julia comes in. Julia: Dr. Fisher is a good psychiatrist; he believes that David is hallucinating. Surely, you have to give some credence to Fisher. Woodard: Yes, and to Sam Evans, but you keep dismissing the fact that Sam saw the child. Ha! You know, personally, I prefer the new Dr. Woodward! He looked much kinder to me than the original actor, and I found myself wanting him to believe David and find Barnabas out. The other guy (much like Burke) really annoyed me with his smarmy attitude. Random: I think the Collins’ mausoleum was my favourite DS location. Great pics today! I also like the mausoleum set. It’s appropriately desolate and creepy. The only set I can think of on TV that is more desolate and creepy is the Cramden’s apartment on the Honeymooners. It always struck me as so sad that those people had to live there. At least no one has to LIVE at the mausoleum. As for Woodard, I’m a fan of the original. Never really had the chance to warm up to this new guy, though I take your point that he’s not going to win friends and influence people by shaming the other actors when they mess up their lines. I’m sure he was just trying to be helpful, but it does indeed look bad. Too bad, though, that Robert Gerringer, the original Woodard, wasn’t there for these final scenes. I think it would have been a lot more dramatic and upsetting for the viewers if those final Woodard scenes had been done with the guy they’d known and loved all along—if indeed they loved him. Well, at least they KNEW him. Great work! I am enjoying this blog so much! Looking forward to much more! Yeah, I agree — it’s a shame they had to recast just at the moment that Woodard takes the spotlight. 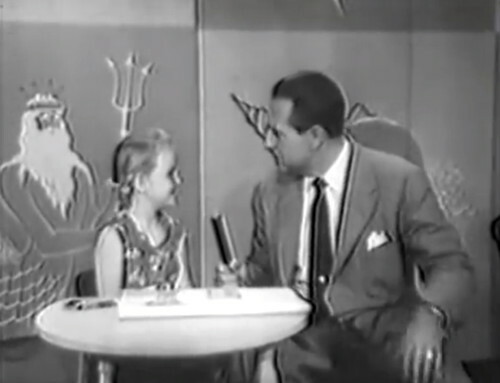 I didn’t love Robert Gerringer, and sometimes I lost patience with him, but it definitely would have been more emotional this week with Gerringer. I forgot how awful this recast was! Lord, today ‘s Twitterverse woulda slammed him… Hard. And not in the fun way. 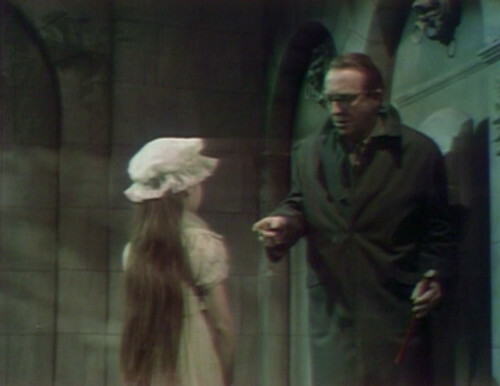 Yeah, Dark Shadows just couldn’t really get recasts to work. There’s Burke and Woodard, and then a Vicki recast about a year from now that just doesn’t work. But they do the opposite — having the same actor play a different role — and it works brilliantly. But, well…there’s the Willie Loomis recast. Brilliance on a platter. 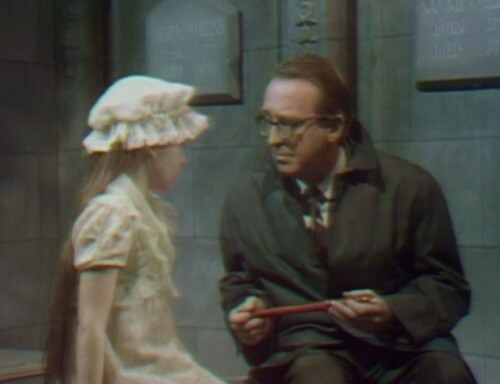 I kind of wondered if they made the recast weak because they knew Barnabas was a big hit, and they knew he was going to kill Dr. Woodard, so they made it so we didn’t care that much. I would have cared if Robert Gerringer’s Dr. Woodard had been murdered, but this one, well I still didn’t like it, but it wasn’t that bad. 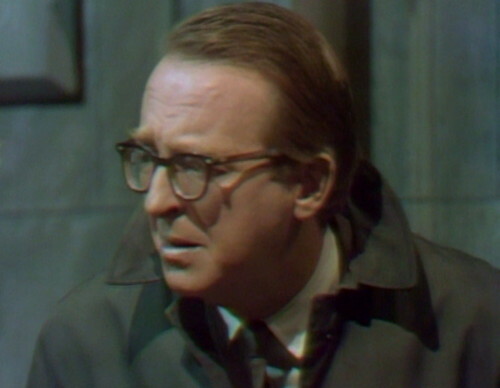 I like Gerringer’s Dr. Woodard, because he looks and acts like he belongs on a soap opera. 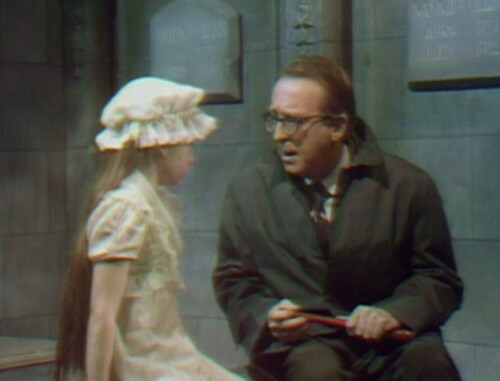 The roles he took on after Dark Shadows would seem to bear this out. When he does a line like “Sam, I’m a DOCTOR!”, he really knows how to bring across melodrama. By contrast, Peter Turgeon is too ordinary looking, is not theatrical, and his voice lacks elocution. Perhaps Gerringer knew that his character was going to be killed off and that it wouldn’t be worth it to put himself in bad standing with AFTRA just for another couple weeks of work. Likewise Daniel Keyes, whose role was even more minor and far less frequent. It appears the production staff knew it too, because it seems they didn’t go to great length to recast the Woodard character for those last couple of weeks. It looks like they went no further than the first bus stop they could find within walking distance of the ABC studios and cast the first guy they found. Because Peter Turgeon, in 1967, looks like that old guy on the bus (or train) who’s reading the newspaper on his way to and from work. Talk about ordinary…. so, what was Sarah looking at in that scene. She kept looking away from the doctor. Was she trying to remember her lines or nervous about the camera. It happens right after the bit Dan quoted, where Woodard “helps” her after she drops a line – I think his interruption threw her and she’s unconsciously looking to the director for reassurance. How did the chains keep Barnabas in his box? 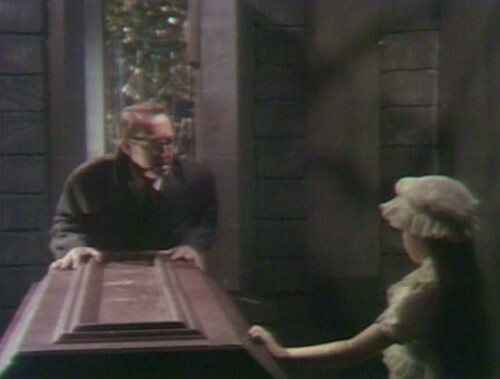 The coffin looks to be wood, which he could surely vampire-smash his way out of – break apart the sides of the coffin and the tension lessens on the chains, wriggle to freedom. Honestly, I don’t think he was really trying. In the scene where Vicki and Burke argue about getting married, or the house, or the weather, whatever they’re talking about – Vicki’s outfit looks like a shapeless remake of an Emma Peel costume, like it’s from a line of Avengers inspired maternity wear. If I remember correctly, Joshua nailed a cross to the inside of the coffin, which apparently immobilized Barnabas. Perhaps the idea was that it created a kind a barrier he couldn’t pass, so he couldn’t even touch the inside of the coffin lid to push his way out. Victoria Winters wore some ugly looking dresses in her scenes, but going back in time ( victorian) the dresses were beautiful. She was very plain, compared to the other actresses.